Washington, Jan 16 (IANS) All five Indian American lawmakers have been nominated to key Congressional panels, the media here reported. All five are Democrats, as are the bulk of Indian-Americans. US Congresswoman Pramila Jayapal, elected to the House of Representatives from Seattle, will serve on the House Judiciary Committee, helping to oversee the federal-court system and law-enforcement agencies, said a report in the Seattle Times. Jayapal said she looks forward to working on immigration reform, criminal-justice reform, reproductive rights and voting rights. Congressman Ro Khanna was appointed to two key committees – Budget and Armed Services, reported daily Mercury News. He represents the 17th District of California, which covers the Silicon Valley communities of Cupertino, Fremont, Newark, Santa Clara, and Sunnyvale. Indian American Raja Krishnamoorthi, who was sworn in as a Member of the US House of Representatives earlier this month, would be serving on two influential committees. In addition to being the voice of Illinois’ Eighth Congressional District, the Democrat will serve on the House Education and Workforce Committee, as well as the House Democratic Policy and Steering Committee, indiawest.com reported. “These committee assignments will give my constituents a voice to make sure I can stand up for working families every day by focusing on job creation and affordable higher education,” said Krishnamoorthi. Congressman Ami Bera was renominated to the House Foreign Affairs Committee and House Science, Space and Technology Committee. He is the senior most among all Indian American lawmakers in the House of Representatives and is also co-chair of the Congressional Caucus on India and Indian Americans, said a report. Kamala Harris, first Indian American to serve in the US Senate, will serve on four influential committees – the Homeland Security and Governmental Affairs Committee; the Select Committee on Intelligence; the Committee on Environment & Public Works; and the Committee on the Budget. Harris said that her committee assignments in the US Senate will be “key battlegrounds in the future of our country”, the Los Angeles Times reported. “At a time when so many Californians and Americans are uncertain about our future, I will aggressively fight for our families and the ideals of our nation,” Harris said. 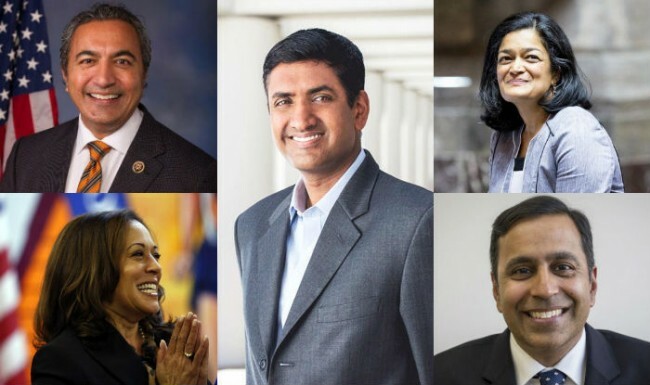 2016 was a bumper year for the Indian-American community, with a record haul of four in the House of Representatives, and their first seat in the Senate.